Welcome to Our Houston East Hotel Elegance and incomparable service converge in perfect balance at the Holiday Inn Express Houston East. Our modern contemporary facility's location off I-10 means you'll have easy access to downtown Houston, as well as to Bush International Airport and Houston Hobby Airport. 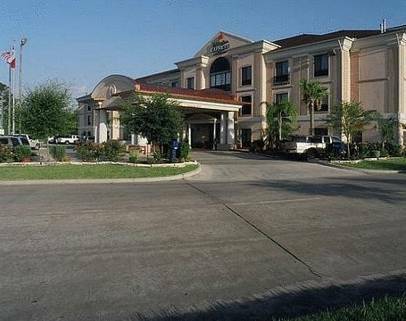 Our hotel is within easy driving distance of many local businesses in the downtown area, the Port of Houston and Baytown. Because we want you to have an extraordinary stay, our Quality of Excellence award-winning hotel features the services you need, including 1,330 square feet of meeting space, a 24-hour business center and free high-speed Internet access. Our hotel's location in East Houston also puts you near the Bayport Cruise Terminal and San Jacinto Monument. After your best night's sleep, you and your family can watch an exciting Houston Astros baseball game at Minute Maid Park or cheer on the Houston Texans football team at Reliant Stadium. Unlike most hotels in East Houston, we offer an array of complimentary amenities to guarantee a great stay, including a 24-hour fitness center and an outdoor pool. Start your day with our free, Express Start Breakfast Bar which now includes hot items. For a relaxing trip to Houston, we invite you to "Stay Smart" at our Holiday Inn Express hotel. We look forward to exceeding your expectations! Universal cuisine, includes indoor bar lounge, lunch, dinner and dessert service available. Located within walking distance. Check with hotel for business hours and ask about our discount program with this restaurant. Steak American cuisine, includes indoor bar lounge, lunch, dinner, and dessert service available. Check with hotel for business hours and ask about our discount program with this restaurant. Mexican cuisine, full service bar lounge, quiet, relaxing atmosphere, lunch, dinner, and dessert service available. Check with hotel for business hours. Excellent seafood cuisine, full service bar lounge, fine dining, lunch, dinner, and dessert service available. Check with hotel for business hours. Commendable seafood cuisine, full service bar lounge, family oriented atmosphere. Check with hotel for business hours and ask about our discount program with this restaurant. Mexican cuisine family oriented atmosphere with lunch, dinner, and dessert service available. Check hotel for business hours. The Grand Texan holds 1330 square feet of opportunity to hold your business meeting or personal engagement. Whether its a training for 50 or baby shower with 70 guests, the Grand Texan provides the elegance and tranquility to make your event succesful! The Galleria Mall is the largest shopping mall in the state of Texas. In just a short 15 minute drive you will experience all of the Galleria shops such as Coach, Gucci and Macys just to name a few. Ask the Front Desk for more information. Reliant Park host many sporting events and conventions each year. The largest of which are the Houston Texans Games, The Houston Livestock and Rodeo and Grand Prix of Houston. Sam Houston Race Park is a horse racing track. Splashtown is a waterpark located north of Houston in Spring Tx. Considered as the worlds largest greyhound racing operation. From the sunny beach to the sizzling night life there is something fun for the enitre family on Galveston Island. Come check out the 3D and 4D Imax, paddleboats and a new golf course at Moody Gardens.